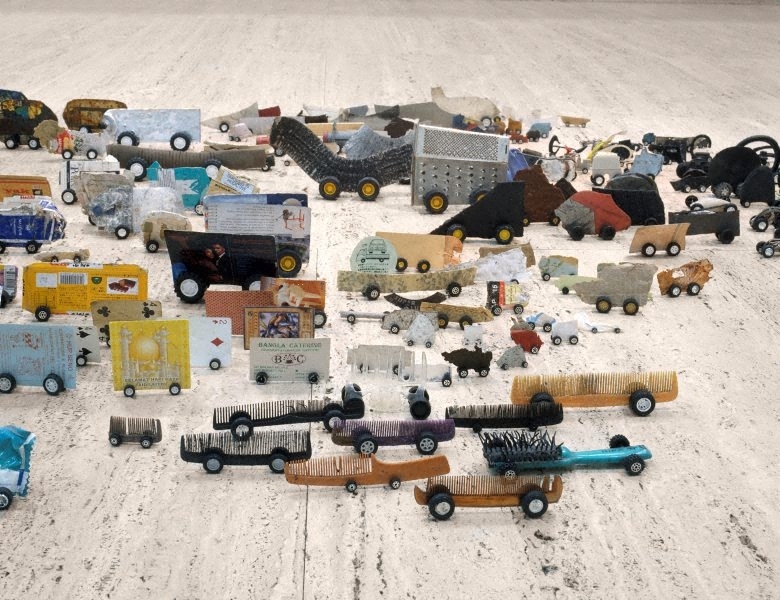 Simryn Gill's installation 'Roadkill' consists of small objects, found squashed on the roads of various cities, and fitted with toy wheels. 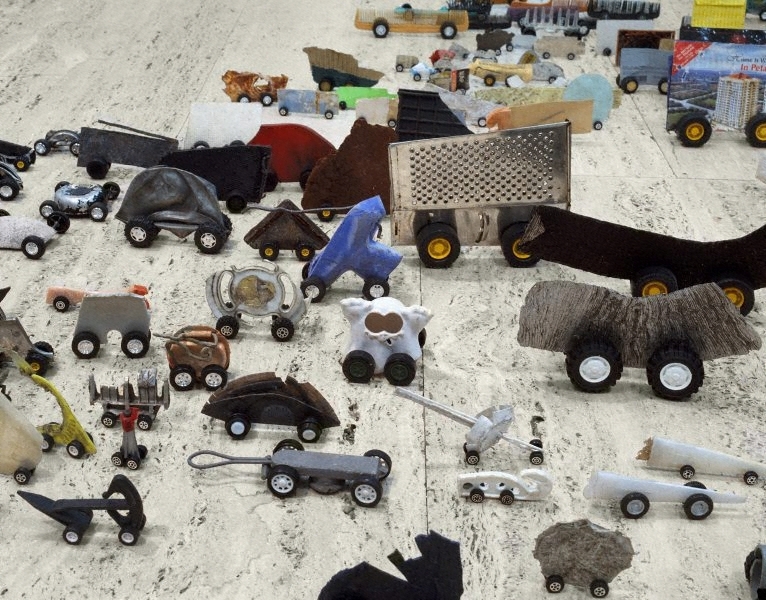 These objects are then placed on the floor in a loose yet compelling configuration: they all face the same direction, relentlessly heading towards an unspecified destination. Clustered together with a herd mentality, they seem to be enacting a group migration, their gathering implying a collective purpose. 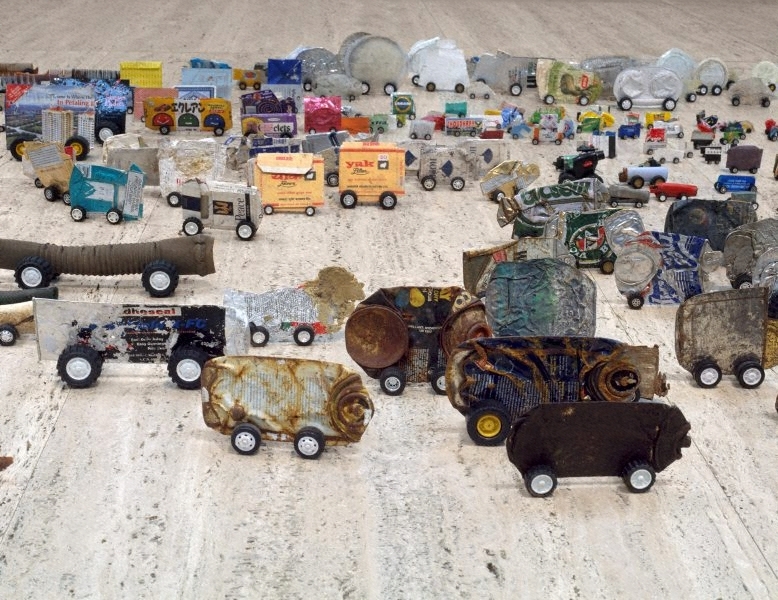 Gill's regenerated consumer detritus suggests a circular process - the objects, once they are attached to their new wheels, have become the very thing that crushed them in the first place. Largely discarded consumer packaging, emptied of their contents and no longer useful; Gill has given them a second chance. The violence of the work's title is offset by the toy-like appearance of these new prosthetically enhanced objects and their subtle transformation from disregarded auxiliaries, secondary to their original function of containing or presenting something else, to the main event itself. 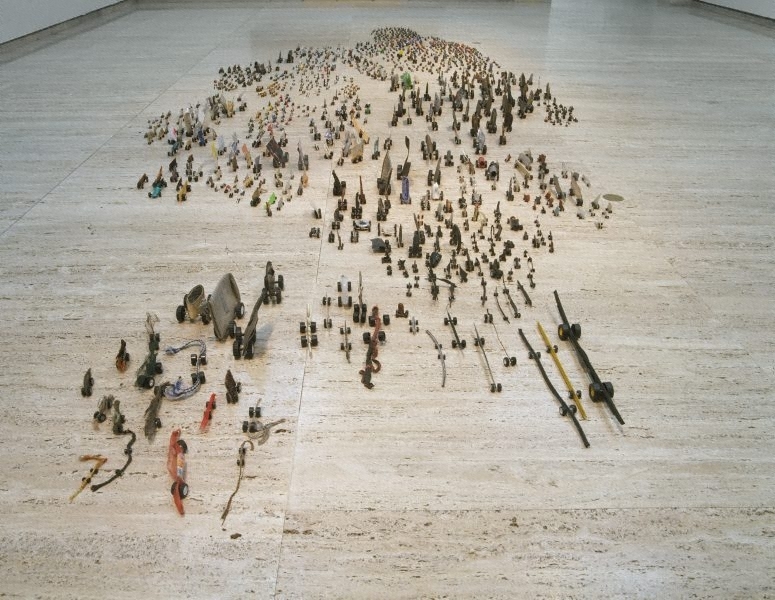 Autobiographical and colonial references are more overt in a closely related work, 'Self-Seeds', 1998. In this Gill mounted seed pods with wheels; Gill gathered the seeds and cones in Malaysia, Australia and in Finland where the final work was exhibited. Gill's wheeled pod invaders are playful, and yet these toys are not to be taken lightly. Gill's interest in vegetation stems from the naming, classifying and depicting of species that was integral to the colonising process and which inserted new flora and fauna into hierarchies of development and usefulness. Gill is not just interested in indigenous species however, she is equally and understandably interested in the introduced. In the conservation ethos that prevails in Australia, where seeds and plants can no longer be brought into the country, Gill sees a worrying subtext of natural and national purity. While motivated by a desire to preserve the fragile native environment, the language used is remarkably similar to that which both the Australian and Malaysian governments now use to police their borders from unwarranted foreigners. The circulation and reception, of images, objects and ideas, is central to her practice. The use of wheels reflects the cultural nomadism and the gentle but insightful humour frequently at play in these works. This relatively simple gesture carries a great deal of weight however, suggestive of mobility, migration, and consumer desires in a world where circulation has become a defining process. As Virginia Ross has written, 'Roadkill' is "...an artwork which transcends its location, its materials, its intellectual grounding and just is, really is, a profound work of art." John Clarke, The Cambridge companion to Australian Art , ''Asian art' in Australia', pg. 217-230, Port Melbourne, 2011, 230, 363. fig.no. 17.12 (colour illus., detail; colour illus. ), between pg. 220 and 221. Kajri Jain, Here art grows on trees: Simryn Gill , 'Pause', pg. 163-184, Sydney, 2013, 169. Stuart Koop, Beep ... crackle: contemporary art from the middle of nowhere , 'Simryn Gill', pg. 76-81, Fortitude Valley, 2008, 77, 80-81 (colour illus., detail). 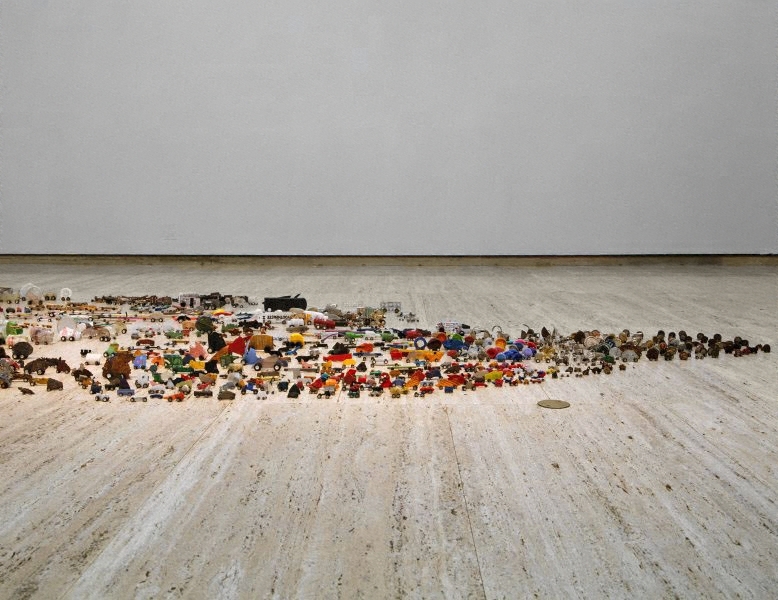 Hans Ulrich Obrist, Contemporary Visual Arts , 'Roadkill: repitition and difference', London, 2000, 29 (colour illus.). Virginia Ross, Like, art magazine , 'Roadkill', Melbourne, Autumn 2001, 44 (illus.). Chaitanya Sambrani, Art and Australia (Vol. 42, No. 2) , 'Other realities, someone else's fictions: The tangled art of Simryn Gill', pg. 216-225, Sydney, Dec 2004-Feb 2005, 221 (colour illus.). Russell Storer, Artlink, vol.21, no.2 , 'Playthings, some contemporary artists and their objects', pg.37-41, Adelaide, Winter 2001, 39 (colour illus.). A small town at the turn of the century , Perth, 2001, (colour illus.). Zoo Magazine , Unknown, 2001, cover (colour illus. ).